M.A.N. foam filters are designed to stand up to the rigors of the pond environment. Durable polyethylene housings are virtually indestructible. They're big enough and tough enough to do the job. Pump is placed in the bottom of the housing. Filter foam is then pressed in to place above the pump. Water is then drawn down through the filter foam and pumped to a fountain or other water feature. Each filter includes two 2" thick layers of heavy duty filter foam that collect pond debris and incubate bacteria that convert toxic ammonia and nitrites to harmless nitrates. This unique low profile design allows these filters to be used in ponds as shallow as 12" deep. This low profile feature also allows placement near the pond edge which allows easy access for cleaning and maintenance. Each filter includes two 2" thick layers of heavy duty filter foam that collect pond debris and incubate bacteria that convert toxic ammonia and nitrites to harmless nitrates. This unique low profile design allows these filters to be used in ponds as shallow as 12" deep. This low profile feature also allows placement near the pond edge which allows easy access for cleaning and maintenance. To clean, simply turn off the pump, remove the filter foam from the housing and rinse with non-chlorinated water then replace the foam without removing the filter from the pond. How Submersible Filters Work. Water is drawn down through the filter foam and pumped to the fountain or other water feature. 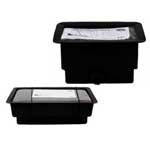 These box filters are designed to work with pumps that have in-line inlets. These pumps are external but directly connect to the filter housing. If a direct fitting connection is not desired, tubing and hose clamps can be used to connect a pump to the filter.